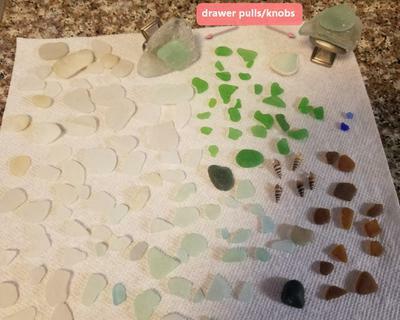 I have been scouring Headlands Beach in Mentor, Ohio after storms for larger pieces of beach glass. I was lucky a couple of weeks ago when I found the 2 large pieces that are shown attached to drawer pulls/knobs. So now I am on a roll to repurpose more furniture to use Beach glass knobs! I also want to make a mosaic on a table top with beach glass, shells, etc. I work from home so I don't get to the lake until 3-4 and end up staying for 3-? hours digging and walking to find my gems! I typically have been trying to go after storms. The first time when I found the large pieces I went to the beach the next day and found that they had moved the shoreline/stones. So I know there are larger pieces under the rubble and that's why I take a spade and dig! When I took the photo I didn't realize that I had so much! I even had more white that were not in the picture! I was really excited with how the knobs turned out and can't wait to finish the nightstand that I am going to adhere them to the drawers!